An Asian-Argentine is defined as an Argentine of Asian ancestry, who pertains citizenship or residency of Argentina . Asian-Argentines settled in Argentina in large numbers during several waves of immigration in the twentieth century. Primarily living in their own neighbourhoods in Buenos Aires, many currently own their own businesses of varying sizes - largely textiles, grocery retailing, and buffet-style restaurants. The small Asian-Argentine population has generally kept a low profile, and is accepted by greater Argentine society. Asian-Argentines primarily migrated in three waves. The first wave was composed of Japanese immigrants (largely from Okinawa Prefecture), that arrived in small numbers during the early twentieth century. The overthrow of Juan Perón in 1955 precipitated a long period of unrest and economic instability that stemmed Japanese immigration after 1960. The second wave consisted primarily of Korean entrepreneurs, settling in Buenos Aires during the 1960s, and the third wave was mostly composed of Chinese entrepreneurs, who settled in Buenos Aires during the 1990s. By the mid-1990s, Asian-Argentines were active in politics, with an example of a political party being a special Unidad Básica (Peronist) party office under the name Unión de Residentes Taiwaneses Justicialistas ("Union of Justicialist Taiwanese Residents) at the heart of Buenos Aires's Chinatown Arribeños & Mendoza. This branch later closed, presumably as assimilation continued, while a regular Unidad Básica opened across the street. Today, there are an estimated of 180,000 Asian-Argentines, with 120,000 of Chinese descent, 32,000 of Japanese descent, 25,000 of Korean descent, and 2,000 of Lao descent. Koreans live primarily in the Balvanera and Flores (where the Koreatown is located) districts of Buenos Aires, and are mainly involved in the manufacturing and selling of textiles. Meanwhile, many Chinese live in Chinatown, which also has a Buddhist temple in Belgrano. 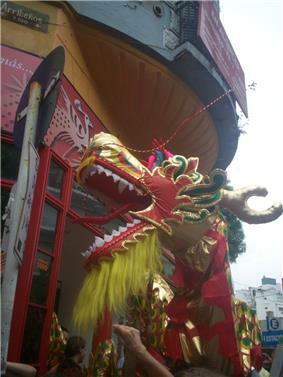 Many are involved with grocery retailing, which has caused Chinese-owned stores to become a common feature of Buenos Aires. Younger generations of Chinese-Argentines (dubbed ArgenChinos) have readily adopted local ways, with some becoming celebrities, including athletes, a film director and an anchorwoman. The Japanese-Argentine community, located mostly in Pablo Nougués city where a large temple was built, has fully integrated themselves into Argentine society today. Sources believe that 78% of the 4th generation Japanese-Argentine community is of mixed European ancestry, while the 3rd generation is 66% mixed, and a majority of them have non-Japanese ancestors and relatives. The Japanese-Argentine community is less visible due to the intermixing with the European immigrants that have also settled in Argentina like the Italians, Spaniards, German, French, Irish, Polish and Swiss. Today they are one of the most distinguishable communities in Argentina because of their mixed race. Many of their Asian features are almost not visible due to their ancestry. In Buenos Aires, the "Jardín Japonés" (Japanese Garden and Teahouse) has become a traditional landmark of the city since its opening 30 years ago. Other Asian-Argentines include smaller clusters of ethnic Laotians, Thai and Vietnamese people. They run restaurants, small groceries and vending stands. Presently, the reputation of the community has been jeopardized due to allegations of corrupt business practices. Investigations within Korean-Argentine textile factories and stores have shown that illegal workers from Bolivia were employed in these places. Because of this, many Korean-Argentines feel that their community has been unfairly targeted due to their economic success. Another incident occurred in June 2006, when the union of truck drivers began a boycott of Chinese-owned stores. This was due to an alleged gun-related incident between a driver and a store owner, which involved illegal firearms. Shortages in stores were reported due to a lack of deliveries until the boycott was officially lifted the following month.